My husband and I went to the Riu in Ocho Rios for our 15th wedding anniversary. That was the most beautiful resort, beach and atmosphere. The staff were great and hospitable. There was 2 large pools, both with a swim up bar and plenty of lounge chairs to sun in. The beach was huge, clean, and roomy. The reef was so close that we were able to snorkle just yards from the beach. I have never seen a resort that took so much pride in cleanliness. There was always someone picking up trash, sweeping, mopping, etc. I was extremely impressed in the care they had for each and every visitor to the resort. They treated us like we were the only ones there and like we were kings and queens. The many resturants they have at the resort all had their own individual style and atmosphere. This by far has been the best all inclusive resort I have ever stayed at. I highly recommend it for families, couples getting married or wanting to get married on the beach, or groups. The Riu is very kid friendly and has activities geared for the different ages. 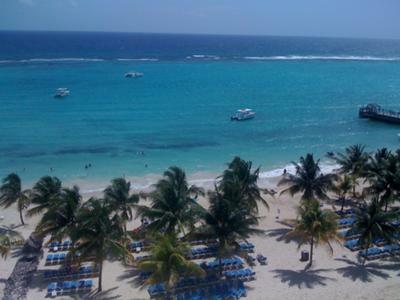 We were so impressed that we have already booked next year's vacation at the Riu in Ocho Rios for the entire family.